I know, I know. But with a last name like Schmickle, how could I resist? 1. I had a bunch of cucumbers from the garden that I needed to use. 2. Besides the spicy carrots I made earlier this month, I'd never made pickles before. 3. I was feeling particularly domestic. And nothing makes you feel uber domestic than pickling...what with all the big jars and whole spices and the wafting aroma of boiling vinegar. I felt like I should be barefoot, pregnant, living at a rural route address, and married to a burly fella named Jethro. Or something. Am I stereotyping? Sorry. The whole pickling experience was just so...country! Not that there's anything wrong with it. I just didn't grow up in the kind of family that canned. I remember my Grandma Martin making wild blackberry jam, with the melted wax layer on top, but that's about it. And my grandparents were pretty country. You see, pickling was a new experience for me. I made another batch of carrots, then three batches of cucumber pickles: bread & butter slices, sour dill spears, and rosemary garlic. The bread & butters is Alton Brown's recipe. I sort of made up the sour pickles by improvising with the spices I had on hand, and the rosemary garlic pickles were an experiment to use up the rest of the cucumbers that wouldn't fit in the other two jars. There are all "refridgerator" pickles in that they are not intended for long-term cellar storage. I didn't boil the jars and do all the proper canning techniques. 2 medium cucumbers, cut into 8ths. 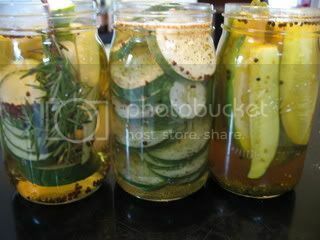 Place the cucumber, garlic, dill & bay in a large jar. Combine the remaining ingredients in a non-reactive saucepan. Bring to a boil and simmer for 4 minutes. 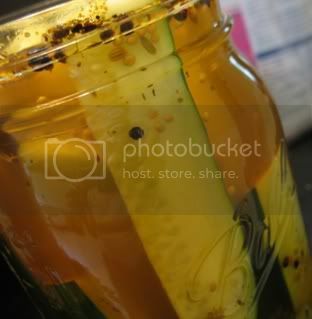 Slowly pour the pickling liquid over the cucumbers, filling to the top of the jar. Grains of Paradise come from West Africa, where they grow on a leafy plant and are easily harvested. The name comes from Medieval spice traders looking for a way to inflate the price - it was claimed that these peppery seeds grew only in Eden, and had to be collected as they floated down the rivers out of paradise. Although Grains of Paradise are now rare and expensive, they used to be used as a cheaper substitute for black pepper. 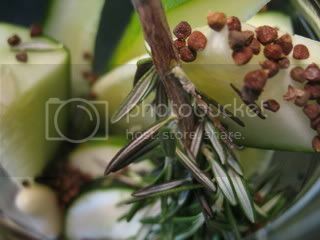 They have a zesty flavor reminiscent of pepper, with hints of flowers, coriander and cardamom. Alton Brown seems to favor these for Okra, as seen on his recent show "Okraphobia", where he makes okra and tomatoes with grains of paradise. We LOVE them mixed with Tellicherry black pepper, put in a pepper grinder and then used to encrust steaks as slight variation on steak au poivre. Grind over any dish where you would normally just grind straight black pepper to add a wonderful shake-up-your-table-condiments twist! A New York Times article written by Amanda Hesser has popularized grains of paradise. She wrote, "I put a few between my teeth and crunched. They cracked like coriander releasing a billowing aroma, and then a slowly intensifying heat, like pepper at the back of my mouth. The taste changes in a second. The heat lingered. But the spice flavor was pleasantly tempered, ripe with flavors reminiscent of jasmine, hazelnut, butter and citrus, and with the kind of oiliness you get from nuts. They were entirely different from black peppercorns and in my mind, incomparably better." The seeds can also be chewed to aid in digestion and to warm the body. This is my entry for Weekend Herb Blogging, which I am hosting this week. If you would like to submit a recipe for this week's round-up, post a recipe on your blog sometime between now and August 2, then email your name, blog title, post permalink, location, and photo to me (kelly AT barbaricgulp DOT com) before August 2. I'll be posting a round-up here on the evening of the 3rd. See HERE for more guidelines. My husband makes pickles for us, when the kirbies are available and cheap. YUM, there's nothing better than a homemade pickle, crunchy and loaded with dill and peppers and garlic. You made my mouth water! These look delicious - can't wait to try them when the cucumbers in my garden are ready. Love the name :). Your pickles sound great. I have to confess, I have never made pickles except for a type of Indian lime pickle, but several of my sisters make great homemade pickles. And I agree, with the title Schmickle's Pickles, how can you go wrong!